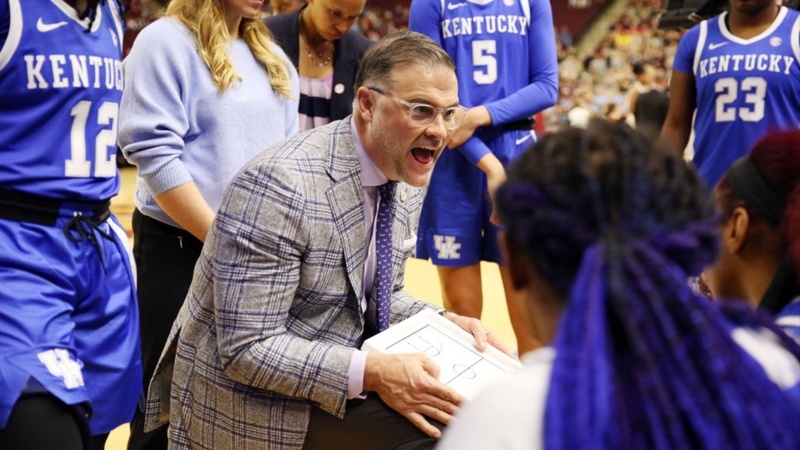 Despite Maci Morris scoring 22 points, pulling down 5 rebounds, and dishing out 4 assists the 15th ranked Kentucky Wildcats fell short in their comeback attempt against #24 Texas A &M on the road, 73-71. Rhyne Howard had a big game as well with 21 points, 8 rebounds, 4 steals, and 2 assists. Kentucky hit 11 of 29 3-point attempts throughout the game, including five from Howard and four from Morris. Kentucky won the battle on the boards 34-31, held a 14-5 advantage in second choice points, but were still unable to come away with the victory as Texas A&M hit 25 of 48 from the floor, including six of eight from behind the arc. Both teams struggled to get going early on offense. Kentucky would make its first shot but missed its next eight. Despite the Cats’ offensive struggles, the Aggies were unable to pull away early in the quarter. Kentucky would cut the lead to three, 8-5 on a three pointer by Howard, however A&M scored the next 6 to lead 14-5. Howard drilled her second 3, cutting the lead to 14-8 before Aggies got an old fashion three to stretch the lead to 17-8. Maci Morris would then drain a three of her own, but A&M hit the final basket of the quarter and held a 19-11 advantage. Kentucky tied the score at 33-33 and 35-35 before Texas A &M would score five in a row. Keke McKinney would hit a big three to pull the Cats closer, but A&M assembled a 10-3 run to lead by ten. Kentucky ended the quarter strong, but would trail by six, 56-50. Kentucky could not get within six for most of the quarter. Morris would get hot scoring 12 in a row cutting the lead to three. Neither team would score again until Howard was fouled on a 3-point attempt. She made two of three free throws getting the Cats within one. The Aggies would get their own free throw to take a 73-31 lead with little time remaining. The Cats were unable to answer, and fell on the road in a hard fought game. Kentucky returns to action Thursday hosting South Carolina at 6:30 p.m. ET on SEC Network.